Now that LA Unified and UTLA have agreed that they can’t agree, they’re headed for mediation later this month. The state Public Employment Relations Board has assigned a mediator to accomplish in three sessions what the two sides were unable to do in 18 meetings over seven months: negotiate a long-overdue contact for the 35,000-member teachers union. “The mediator’s job is to keep the parties engaged in discussions until they reach an agreement,” she said. Only the mediator can determine that the two sides are unable to reach a resolution. If that happens, she explained, negotiation cease, triggering a “Fact Finding” process in which each side is required to produce records and data that bolster its bargaining position. Some district officials have speculated the teachers union is biding its time until May when the governor will present his revised budget, often called “the May revise.” The California Legislative Analyst’s Office has projected a boost of $2 billion in anticipated revenues, which is good news for teachers who have been told repeatedly that the district doesn’t have the money for a bigger pay raise. LA Unified’s most recent offer is a five percent pay increase, retroactive to July 1 of last year, with an increase of the minimum salary to $50,000 from $45,637 and $13 million to help reduce class size. In a related development, Superintendent Ramon Cortines last week sent a letter to UTLA, suggesting that the union and the district work toward an agreement on teacher evaluations. According to Cortines, the district could lose $171 million in federal funding — $57 million per year over the next three years — if the union doesn’t agree to a three-level overall teacher evaluation, a requirement for the district’s No Child Left Behind waiver. In 2013, the district implemented a new overall teacher evaluation system that raised performance levels to four from two. The union objected, saying it never agreed to the new terms and argued that the new system created a path to establish merit pay to reward the highest performing teachers. 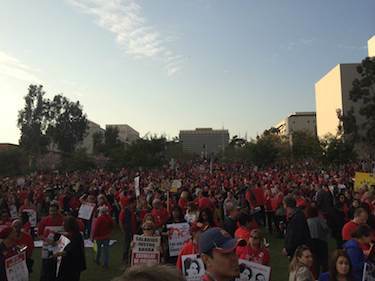 The union took the issue to the labor board, and a PERB judge agreed with UTLA that the district acted unlawfully, and ordered the two sides to renegotiate the terms. But the clock is ticking on LA Unified’s application to renew the waiver. The deadline is March 31. Alex Caputo-Pearl, president of the teachers union, has expressed his interest in negotiating all issues at once, not carving a singular one, pending movement on the others.